We are one of the largest organisations in the country, with pockets of good and bad practice, so we must learn from each other. The survey is one of the few ways we can objectively compare, on the basis of concrete data, how things are going across departments and agencies with a diverse range of functions and roles: JobCentre advisers, the Border Force, prison officers, coastguards, policy makers. We all have very different roles, but there are common challenges such as leadership, improving skills, pay and reward, work-life balance, performance management, bullying and so onwhere we can all share learning. For example, the Department for Work and Pensions’s “DWP Story” has played an integral role in the improvements in DWP’s leadership and managing change scores (up an amazing 17 percentage points from 2011 to 2013); and now HMRC are adopting a similar approach as part of their ‘Building our Future’ initiative. 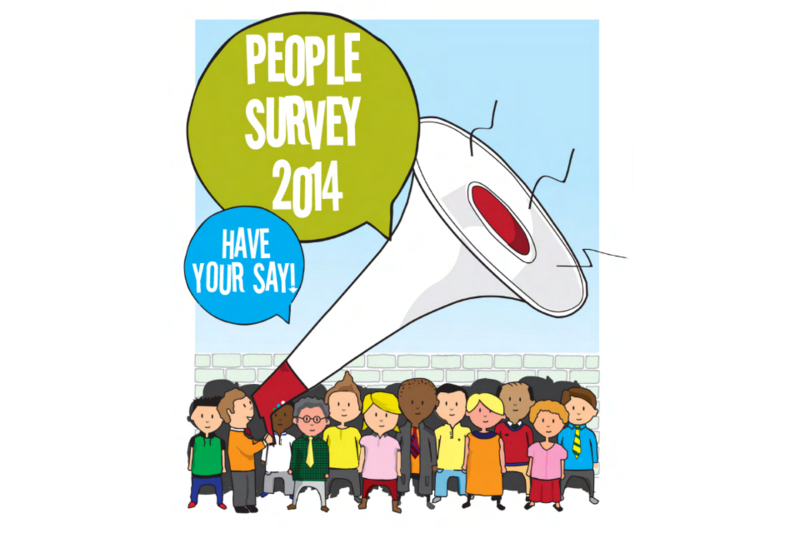 The People Survey also allows us to focus on our own team’s behaviour. Last year we provided scores for 8,500 individual teams. We often talk of the importance of challenging each other or saying when things could be done better and I appreciate that this isn’t easy for everyone. But the survey allows people to be very honest. Looking at our own teams’ scores can help us see where things are working and where things need improvement. The survey provides us with an opportunity to talk within our teams and understand how we can work more effectively and better support each other. The tool can sometimes confront us with some tough messages as leaders and managers, but without honest challenge we will never improve our ways of working. It may sound like a cliché but if you don’t complete the survey you will miss out on the chance to help shape change. The survey’s main objective is to make us work better, and it can only do that if everyone participates. So for those of you who haven’t yet been able to complete the survey I want to encourage you to take part and have your say. It takes no more than 20 minutes. Check your local intranet or ask your manager about how to take part in your department or agency. I promise on behalf of the Civil Service Board that we will do out utmost to act on the results! I will let you know why I DON'T think we should do the survey. We let management know what we think in 2012/13. On that basis, they instituted a bizarre and broken Performance Management system on the basisi that the survey showed we wanted something done about poor performance. Well, I don't know about anyone else, but I never wanted this Performance Management system. And in any case, the poor performance that I was concerned about was the poor performance of senior management - who's introduction of the Performance Management system only served, in my perception, to worsen their performance! Management is some Departments have been claiming that our engagement is a measure of our morale. I have seen no proper justification for this; certainly engagement is a factor in morale, but it is not the same as morale. Many civil servants are very engaged - for many it's pretty much a vocation - but that does not mean their morale is high. Actually, morale is pretty low across the board, which is not surprising since most of us are feeling the squeeze, no real pay rises for years; paying more for pensions, have less scope for promotion, and - let's face it - the near-certainty of more cuts in the next few years. Claiming our engagement is high or middling, therefore our morale is high or middling, is rather disingenuous. "I promise on behalf of the Civil Service Board that we will do out [sic] utmost to act on the results!" Nobody believes that. Nothing has been done in the past to improve anything. We've had the survey results used to justify the horrific stack-ranking PAR. We've had one-way blogs from seniors as their tick in the 'engagement' box. We've seen tiny improvements in unimportant areas spun into massive 'success' stories, while the big important areas are all but ignored. If anything, any tiny thing the Board does improves the lot of Civil Servants I will happily eat my words, but we all know that ain't going to happen. The civil service staff survey only means something when managers don't cherry pick numbers in the worse form of statistics abuse. Such as management claiming that engagement scores have improved when actually it is due to a reducing turn out by the grunts (because they've given up on it knowing it is a waste of space) and so the results are skewed by management grades making up a greater proportion of the people actually taking part in the survey. When will management own to up an engagement score of 50% on a 50% turn out actually being an engagement score of 25%? Management have shown their thanks to all the hard working AO's in the Work Service Directorate and offered ….no… not a much deserved pay increase ……..but……………. voluntary redundancy. Fool me once shame on you. Fool me twice shame on me. The Home Office used the results of the survey to justify introducing forced distribution in the PDR system. I have no idea what their next demoralising initiative will be (penalise the sick, remove annual leave, freeze pay ...) but I'm fairly sure that the outputs of the survey will be used to tell us its what we asked for if there is even the most tenuous link to any statistic in the survey. Sorry, but I won't be completing it until our managers show that they can be trusted not to put spin, more spin and yet more spin on the results. I won't hold my breath. The previous comments are spot on. The survey is open to military staff which skewers the results even more. The response by senior managers (without reserach or proper staffing) has destroyed a great deal e.g. trust, morale and so much more. Even our senior managers are joining in the national sport of vilifying and treating civil servants as inefctious lepers only fit for destruction. How much money are we paying this company every year to conduct the staff survey ? Unless you work for the Highways Agency as we will no longer be civil servant from April. We are on the first steps to privatisation so surprisingly most of us don't care or believe this. This is your oppurtunity to put things right.Be positive . I agree with Terry's comment that managers claim engagement is improving when the number of staff taking part in the survey has reduced. This contrasts with their complaints about strike action only being voted for by a small proportion of union members, sorry Sir Jeremy, you can't have it both ways. I believe all staff should complete the survey, so that managers don't get the wrong impression that things are improving. Also it is worth remembering that whenever PCS call a strike we have messages from senior management about how we are damaging the services we supply to the public, but when ARC called a strike nothing was said. As for HMRC's "Building Our Future", we have in effect been told the destination, fewer staff, fewer offices and more digitalisation, and therefore all we are being consulted on is the route to getting there. "Building Their Future" would be a more apt title. 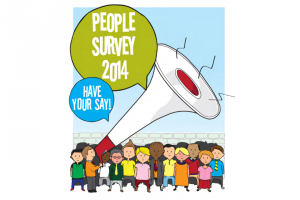 If the People Survey is so important why do only 2/19 Perm Sec's have EE objectives? - where is the accountability Sir Jeremy? I have completed the survey, and told the truth - 'That nothing will change for the better'. Looking forward to being disciplined! We did not take part in the Civil Service survey, since our results have been so bad, it was better that we conduct our own. Not that any action has been taken, except the umpteenth reorganisation in the last few years, and the appointment of yet even more interims to hopefully boost the results next time around. The lack of sincerity by senior managers, means that everybody is just covering their backs, fear is not a good tool for performance! The morale of the junior staff is unimportant, until it affects the performance of line managers. Then some knee jerk wheezes for 'fun ' and 'engagement', are an attempt to mask the underlying malaise. The game is to pretend you are enjoying yourself at work, to increase your chance of promotion. That style counts far more than substance is the biggest disappointment of joining the Civil Service (alongside chums of the 'right' background having preference for training and promotion). Every year I complete the survey & give an honest opinion. This year I am absolutely furious at the pressure being put on staff from above & further more to complete the survey in a favorable light. As a result I have completed & have put the worst answer to absolutely every question, I will continue to do this until senior management stop trying to bully staff into completing it & trying to influence our responses. Well said Terry. Most of the positive engagement scores reflect the views of the over-pampered fast track brigade and senior managers. I also detest the way politicians abuse the statistics to justify their ideology stance on Trade Unionism and strikes. I don;t even know why they ask questions about pay as it is clear that departmental managers can't do anything about it. Um...no, it doesn't, as a matter of fact. It just means that we know nothing about the opinions of 50% of the people. And if we don't know what the problems are, how can they be fixed? I think Sir Jeremy Heywood sums it up in the last line of his blog text; "I promise on behalf of the Civil Service Board that we will do out.......". I'm assuming this is a typo (e.g. he means 'our'), or does he mean 'owt', which let's face it is what has been the result in the past - and if by promising to do anything means creating something as appalling and derisory as the PAR/PMR system we now have to endure, then please don't bother! I work for Natural England and receive Civil Service News e-mails, including the one with the article titled "Does the People Survey matter? "; however, I am unaware of having been asked to complete this survey that, apparently, "Every October we are all asked to complete". Who is "we" in this context? If this "we" does not include NE then why do NE staff receive these e-mails? If it does include NE, how were NE staff invited to participate? Cheers. Sadly I do not think the staff survey will ever be a true reflection of the views of staff. Those that are engaged will reply. The most disaffected do not complete it. I hear around the kitchens here 'what's the point, they do what they want anyway' and 'last time we got the enforced distribution grading system, what's next?'. How about making it compulsory and including 'vote of no confidence' button at the beginning. I think senior management would be in for quite a shock. Earlier comments about engagement and morale hit the nail on the head. Civil servants tend to be passionate about their actual work but it doesn't mean they enjoy the environment and culture they are forced to work in. I agree with most of the comments here and it is quite obvious that the general opinion of the staff survey is that after all these years the survey hasn't worked to improve things for us so why bother completing it. I have also noticed the desparate attempts to "engage staff" by setting up endless work discussion groups and asking for "volunteers"...if you don't "volunteer" you get nominated. Really what is the point of the people survey? We know that the main issues are skirted and the only issues raised are what suits senior management, so why complete something of no value. This will become evident as the amount of participants continues to drop year on year. To add to my colleagues's previous posts about the new Performance Management system coming from a previous staff survey, I should also point out that the changes to privilege days also came out of a previous staff survey. The survey is at best mediocre, the questions are ambiguous and disenfranchising staff. Asking people their opinions on things that Senior Civil Servants and Managers are unwilling or unable to change is useless information gathering and again serves to devalue the Survey. My significant concern however, is that ""The tool can sometimes confront us with some tough messages as leaders and managers"" - it beggars belief really. Last time I checked, this is the exact same management that should have it's finger on the pulse with a grip on key factors influencing performance within their departments. If this is a tough message to hear one day a year, there is a suggestion that 364.25 days of the year these people are ignoring the elephant in the room. Can I suggest any employee at SEO or above gets a "must improve" box marking as standard until such times as the survey feedback is not such a kick up the behind? The constant change of senior management results in constantly changing and conflicting priorities and that is decimating staff morale. "Empowering" means telling them it's their responsibility to hit unrealistic productivity because easements are in place when the easement is to churn out work at any cost then kicking staff when they are down, accusing them of shortcutting quality - or redefining "quality" as delivering any outcome as long as its sooner rather than later.. not "the right answer as soon as reasonably possible" .. In my opinion there are too many people who shouldn't be needing a survey to work this out for themselves clearly spending too much time listening to yes (wo)Men and not asking those who deliver daily. in the outside world these are the people needing a voluntary exit package propelled by footwear applied to gluteus maximus. Nothing changes. Management only ever talk about the so called positve results of the survey and never want to get to the bottom of why many staff are unhappy. I've heard all the management talk year, in year out. Can we please call time out with the Staff Survey and I agree about the previous comments about the PMR. I have no confidence in senior management taking any real action. I agree with the other comments: As staff survey results were used to justify the introduction of the universally unpopular PMR system (which is many times worse that what we had before) I have no confidence in the ability of senior managers to interpret and act on future staff survey results in a way that leads to genuine improvement (as opposed to decline) or is really in line with the staff concerns that lie behind the survey results. Surveys and polls have their limitations - they can usually be interpreted in numerous ways and rarely give the full picture. If senior managers really care about engaging with staff they would do better I think to pay attention to feedback on this and similar sites to get a snapshot of how staff feel and take away expressions of common sense. The senior manager that has the courage to abolish the PMR changes on the grounds that this were misguided will instantly improve staff engagement in my view. I'd be much more interested in an article entitled: "Why is the People Survey Impotent?". Read the actual figures to see the trend of those dissatisfied.......and then read the "comments" highlighted in red that tries to give a completely different picture. I am so glad I read this thread. For years i wondered if I was the only who could see through the disingenuity of this survey. A trojan horse for managers to introduce ever more unpopular surveys. A tool for politicians to spin stories of high levels of engagement and bash those who have the audacity to question some rules of association. I have already told the managers of ths survey that i will never complete it if they proceed to use dubious statistics to justify their ideas. Mainly the statistic on managing poor performance generated by a load of smug civil servants who would be better engaged focusing on their own performance. It is quite clear to me that any statistics on 'high levels of engagement' primarily reflect responses from those in senior management and fast track grades. In short, those who can stil see some blue sky. The rest remain subject to motivation by fear. It would be nice to see some responses to the above comments to demonstrate early awareness of our concerns. But I think Sir Bob had over 500 comments on his PMR blog and no real response was given by anyone. I am tired of being the whipping boys and girls for everything that is wrong with UK plc: too many of us, overpaid with fat cat pensions, not digital enough, don't see the bigger picture, cut the pay and raise the pension contributions instead of tackling the MPs' friends in the banks. I wish I believed anyone really cared at all about the Survey views and HM's hard-working and increasingly desperate civil servants. 4) All Civil Servants to be given a immediate £2000 pay rise.